Now it’s your turn. In the comments section, post the saddest story you can think of using only three words. I’ve been advised against writing in first person several times. The general advice seems to be that publishers don’t like it and it’s harder for readers to get into the story. I could never understand that because I’ve alway loved reading first person. It pulls me into the story. When I’m reading first person, I get so absorbed in the story that I forget I’m reading. It feels like the story is simply in my head. The narration of third person constantly reminds me that I’m reading words on a page. Thinking back, it seems that all the books I would binge read were in first person, while third person was easier for me to put down and function like a normal person (which is important sometimes). Book promotion is essential for authors. There are millions of books published on Amazon every year. How do we, as authors, make ourselves stand out in the crowd? At a 2-day marketing conference I attended recently, I learned about something called Renegade Marketing. Renegade marketing involves creativity. Authors are creative people. We create worlds, develop characters with distinct personalities, and write books about them. Surely we can come up with creative ways to promote ourselves and the stories we write. I will be the first to admit that promoting myself and tooting my horn is something I am not comfortable with. But even an introverted person like me can market like a renegade. The key is to do something no one else is doing. Every author uses business cards, postcards, and bookmarks to promote their books; these items are must-haves. But what can I do that is different? What will draw attention to me and attract people to my table, thus creating potential book sales? Props! Props are great. And since my books are medical-themed, a stethoscope and lab coat will work nicely. Many authors give away free things, like candy and bookmarks, but I recently purchased a bulk supply of syringe pens with my name and website printed on them and I will be giving these away during public events. Every person who stops at my table will get a free syringe pen. How cool is that? Let your characters sell the book for you! I have done this several ways. First, I’ve written a string of blog posts (Meet the Characters) where I introduce each character in my book(s), one at a time. Also, I have recently done a character interview where my main character, Randy Hanson, answered the interview questions. This interview will be published June 9th. I’ll post it once it’s live. Generate Buzz! Talk about your book. Develop a 5 second sales pitch, do radio interviews, attend book festivals and signings. Get yourself out there. Talk to people. Post on social media. Generate buzz about your book. Book Cover! Use your book cover to attract people. During signing events, I display a large poster of my book cover. I also have my book cover printed on promotional materials (see coffee mugs above). My husband also has a shirt, and I bought a baseball cap for my son with my website printed on it. Be different! Stand out. Let potential readers get to know you. Post on social media sites. Share pictures of yourself being a real person. Do interviews, be silly, let people see who you are. Give them a reason to follow you. Book sales are generated by connecting with readers. Don’t be afraid to be different. Think outside the box. Market like a renegade! With the release of Sand & Sutures, the second book in the Scrubs series, it’s time to introduce you to a new character, Greg Hutchins, a resident doctor at the University of Washington. Education: Earned his M.D. from Oregon Health and Science University. Currently in the OB/GYN Residency Program at the University of Washington School of Medicine. 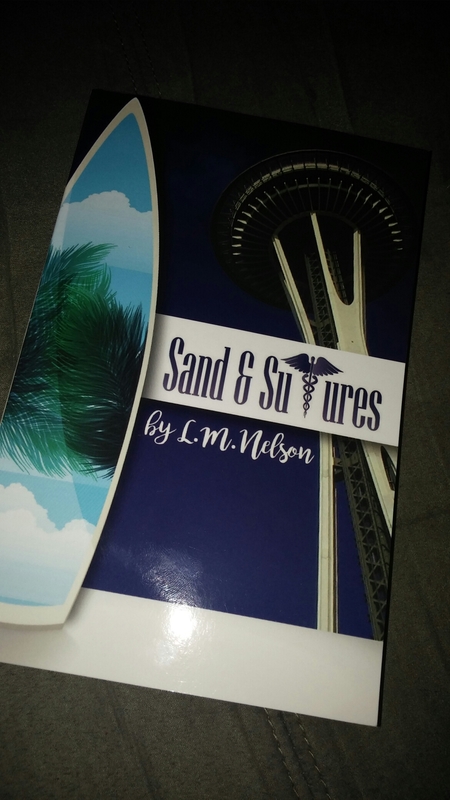 To kick off summer, and the release of Sand & Sutures, I will be giving away a Kindle version of Scrubs, the first book in the Scrubs book series. No purchase necessary to win. Just click on the above link. Thank you for participating, and good luck! I am clueless when it comes to book marketing. Ok…let me rephrase that. I WAS clueless. But last weekend, I had the wonderful opportunity to participate in the Celebration of Authors Conference in Austin, Texas. This event, sponsored by the Texas Association of Authors, offered tips and advice about marketing not only my books, but myself as an author. My weekend began by waking up at 5:00 A.M. on Saturday morning and taking the hour and a half drive up I-35, through horrid traffic, to Austin, TX. I pulled into the parking garage of the Downtown Sheraton, snagged my parking pass, and circled up to the third level. Once checked in, I stepped into the conference room to this amazing view. I guess that explains why the room was called the Capitol View Terrace. My morning was crammed full of various sessions that targeted marking. Sessions about advertising, making the most of Amazon Author Central, choosing keywords for search queries, and information about e-books, internet radio, and how to utilize the internet. I met many other authors, exchanged business cards, and even had my picture taken with some of my new connections. When we took a break for lunch, I popped down to the hotel restaurant, and to my surprise, the keynote speaker, Judith Briles (an award-winning author and marketing expert), sat down at the table with me. Over lunch, she shared a few tricks of the trade, and I walked away with a signed book in my hands. Following lunch, I returned to the Capitol View Terrace and the sessions continued. In the afternoon, I learned about an awesome app called Squirl and received information about audio books. Around 4:00 P.M., when the sessions were over, I made the drive back home, overwhelmed with information and trying to soak in everything I heard throughout the day. Sunday morning, I returned to the Sheraton to hear more tried and true marketing methods, including how to solicit appearances and how to market renegade style. A fellow writer informed me about a few local writing groups I didn’t know existed, and we danced and sang along to a video called All About Those Books. Learn how to be an author. Get yourself out there. Be unique. Do something no one else is doing. Write what you’re passionate about and don’t try to feed into the market. The market changes too much. Overall the Celebration of Authors event was well worth the money I paid to attend. It was full of networking opportunities and taught me a lot about the publishing world. By the end of the weekend I walked away with a ton of resources and gained many insights about marketing. With all the ideas rolling around in my head, it will take me a while to digest all the information I received, and baby steps to implement it all.